Our product range includes a wide range of wood cement board. Over the years, we have been engaged in offering an exclusive collection of Wood Cement Board. The offered cement board is designed with high level of precision in sync with set standards utilizing quality approved material and best techniques. Also, this cement board is known in the market for its superior finish. We provide this cement board in varied specifications as per the specific requirements of our customers. The product standard size: 1200 x 2400 mm., 1220 x 2440 mm. The standard thickness size: 8, 10, 12, 16, 20, 24 mm. 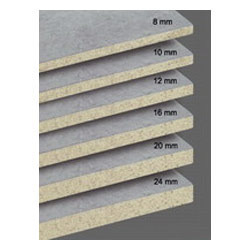 Looking for Wood Cement Board ?